NETWORK FINALS: LAST MAN STANDING, HAWAII 5-0 and SHARK TANK gained 0.1 in final numbers. CABLE HIGHLIGHTS: Discovery’s GOLD RUSH remained at the top of Friday cable, even though it fell 0.11 to 0.96, and lead-out THE WHEEL was down 0.09 to 0.34. A pair of NBA ALL-STAR WEEKEND events were in the Top 10, a 0.74 telecast on ESPN and the 0.48 RISING STARS game on TNT; in addition, a PBA BOWLING show unusually hit the Top 10 for ESPN at 0.38. HBO’s REAL TIME WITH BILL MAHER, sparked by a much-publicized segment with Milo Yiannopoulos, rose 0.07 to 0.56. Bravo’s MARRIED TO MEDICINE gained 0.06 to 0.40. On Lifetime, BRING IT and THE RAP GAME were both at 0.40, respectively steady and down 0.02. A&E’s LIVE PD ticked up to 0.35. Food Network’s DINERS, DRIVE-INS & DIVES also added a tick for 0.34. On HGTV, MY LOTTERY DREAM HOUSE joined the up-a-tick group at 0.32, HOUSE HUNTERS INTL lost a tick to 0.28, and HOUSE HUNTERS fell 0.11 to 0.26. 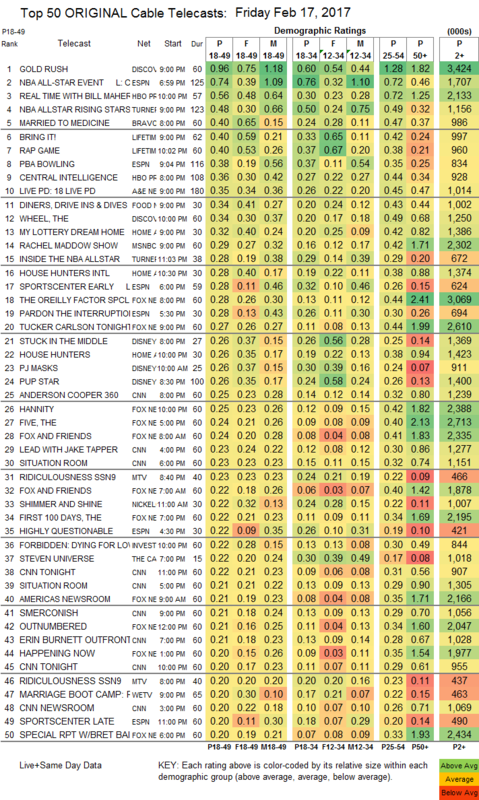 MTV’s RIDICULOUSNESS was at 0.23/0.20, compared to last week’s 0.32/0.28. 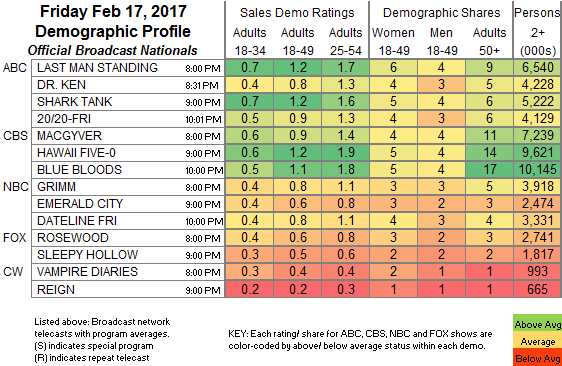 We’s MARRIAGE BOOT CAMP climbed 0.04 to 0.20. On TLC, PARANORMAL LOCKDOWN dropped 0.04 to 0.18, and the UNLOCKED after-show was down 0.02 to 0.15.